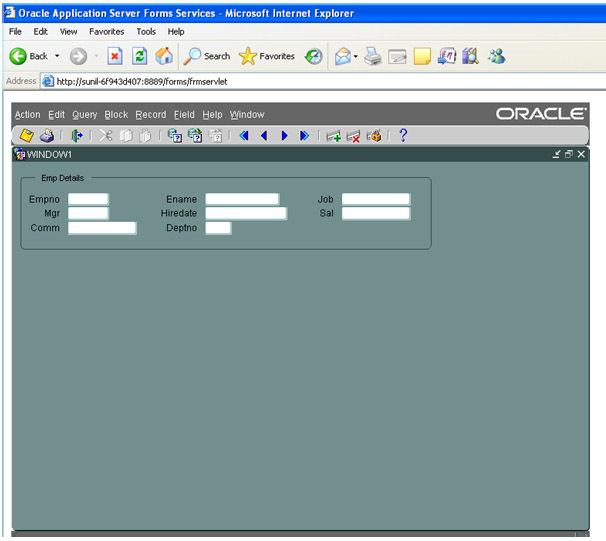 Native frontend tool of Oracle. 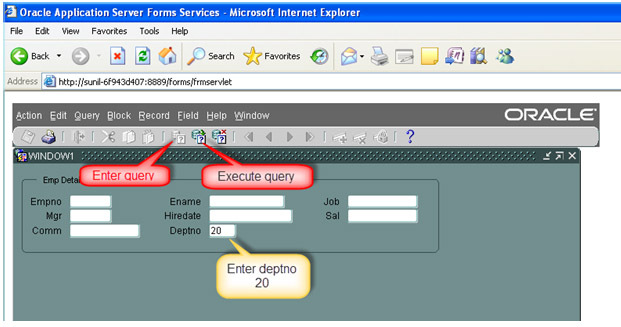 Supports to view and define database objects from forms environment. Supports to share properties of controls using visual attributes and property classes. Supports to share application with multiple users and multiple platforms. Used to develop user friendly application screens for data manipulations and retrieval purpose. Used to represent information for read only purpose in a user friendly format. Used to represent the information in char formar with X and Y co-ordinates. Supports to manipulate data or retrieve data available in RDBMS. Allows to create components and navigate between other screens of forms. Used to design application screens. Supports to create controls ( GUI Controls). Used to assign properties for controls. Used to provide code for procedures, functions, packages, triggers. Used to make components like blocks, canvas, charts, LOV. There are two important forms components. Represents collection of controls (items). Block created based on table, view or synonym or stored procedure. Block created without any table. It will not represent any table. Control blocks are created manually. Used to hold block items. It is a container which can hold more than one block on it. Canvas can be created through layout wizard or manually. The default type of canvas is content canvas. Default type of item is text item. Text item: It is an editable control, used to represent column of a table. At least one content or tab canvas must be there to run the application. At least one editable item must be available to run the application. 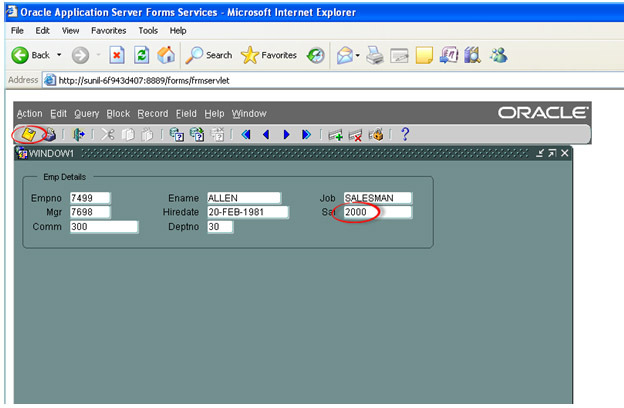 Whenever base table block is created in a form, it automatically frames an internal insert, update, delete and select statements. Data block wizard -- Used for creating datablock. Layout wizard -- used for creating Canvas. Chart wizard -- used for creating chart. Report wizard -- used for creating wizard. 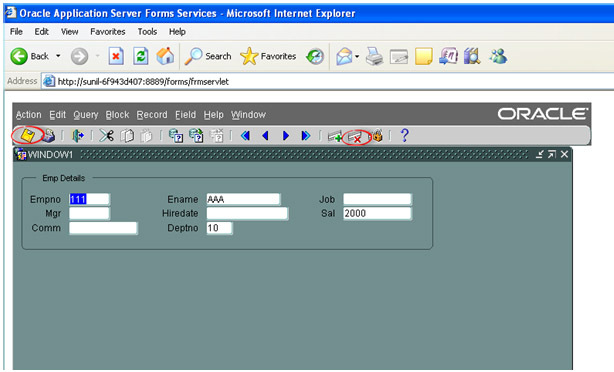 Open the "Form Builder" tool. 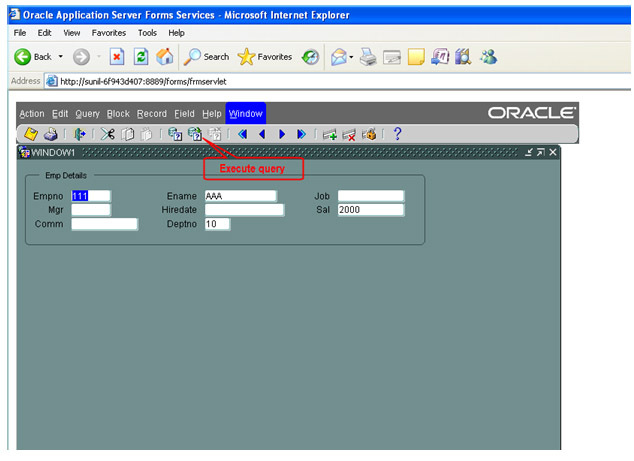 You will get the Welcome to the Form Builder window. Understand hierarchy. It is simple. In your desktop, in your folder MY_FORMS , Observe .fmx file is generated. When we compile fmb file, fmx file is generated. Click on Run Form Icon. It will prompt to install Jinitiator, Install it. Your Form is opened in the browser. Now, Enter values in few fields like empno, ename ,sal , deptno, click on save. You get a message, Transaction complete: 1 record applied and saved. 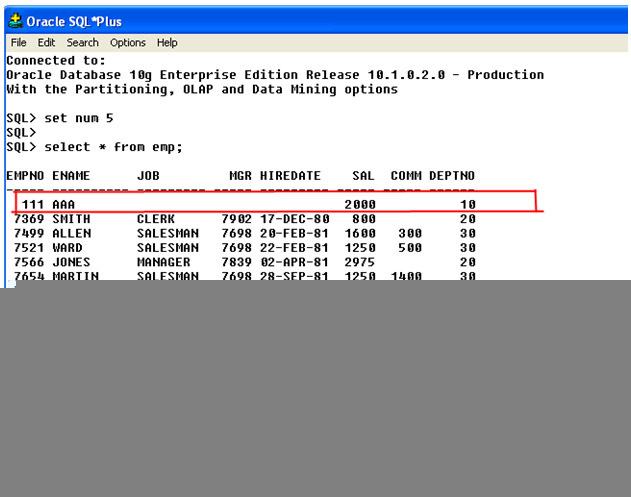 Now check your EMP table in the database, you can see the new row is inserted. To look at the next row click on next record. To look at previous row click on previous record button. To change the salary of ALLEN from 1600 to 2000. Go to ALLEN record, change the value of sal field to 2000. To delete the row of empno 111, traverse the record, click on delete button and save. Look at the EMP table , empno 111 is deleted. To see the details of all the employees working in deptno 20. Now, when you click on next record, you will get only the records working in deptno 20. Create FORM using rail_reservation table.